When astronaut Scott Kelly snapped a stunning photo of south India on the night of Nov. 15, Internet chatter speculated over what appears to be something else in the picture above India -- shown in the closeup above. Kelly, who recently broke the record for longest time spent in space by an American, tweeted the picture back to Earth from the International Space Station. 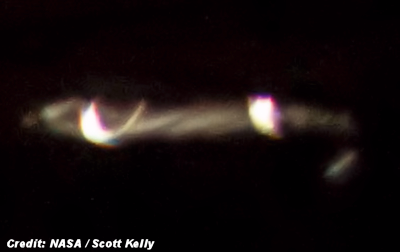 UFO hunters came out of the woodwork, alleging he also photographed a bright, tubular-shaped UFO in the upper right of the image (as seen above). That's right -- the UFO is, in fact, a UHF antenna, part of the International Space Station, which is probably why Kelly didn't notice it as anything unusual.